Telomeres are visible here as white dots. NIH Library. Telomeres, structures that cap the ends of cells’ chromosomes, grow shorter with each round of cell division unless a specialized enzyme replenishes them. 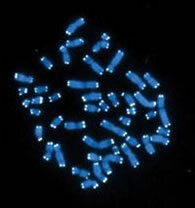 Maintaining telomeres is thought to be important for healthy aging and cancer prevention. By this measure, T cells, or white blood cells, from patients with the autoimmune disease rheumatoid arthritis are worn out and prematurely aged, scientists at Emory University School of Medicine have discovered. Compared with cells from healthy people, T cells from patients with rheumatoid arthritis have trouble turning on the enzyme that replenishes telomeres, they found. Reversing this defect could possibly help people prone to the disease maintain a balanced immune system. The results are published online this week in Proceedings of the National Academy of Sciences. In rheumatoid arthritis, T cells are chronically over-stimulated, invading the tissue of the joints and causing painful inflammation. This derangement can be seen as a result of the loss of the immune system’s ability to discriminate friend from foe, says senior author Cornelia Weyand, MD, PhD, co-director of the Kathleen B. and Mason I. Lowance Center for Human Immunology at Emory University. In childhood, new T cells are continually produced in the thymus, she says. But after about age 40, the thymus “involutes” – or shrinks and ceases to function. After that, the immune system has to make do with the pool of T cells it already has. "What we see in rheumatoid arthritis is an aged and more restricted T cell repertoire," she says. "This biases the immune system toward autoimmunity." Weyand, postdoctoral fellow Hiroshi Fujii, MD, PhD, and their colleagues were interested in mechanisms of T cells’ premature aging, because scientists had previously observed that in rheumatoid arthritis, T cells tend to shift the molecules on their surface and function differently. They found the answer in telomerase, the enzyme that renews telomeres and is necessary to prevent loss of genetic information after repeated cell division. Telomerase adds short repeated DNA sequences to the ends of chromosomes to protect them. The enzyme is active in embryonic development but is usually switched off in adult cells. Many cancer cells reactivate it to enable runaway growth. T cells are some of the very few cells in adults that can turn on telomerase when stimulated, probably because they have to divide many times and stay alive for decades. Weyand and Fujii found that T cells from patients with rheumatoid arthritis make 40 percent less telomerase enzyme when stimulated. The cells came from 69 patients, 92 percent female, with an average age of 50, and were compared with cells from healthy people with similar demographics. Shutting off a gene encoding part of the enzyme made normal T cells vulnerable to programmed cell death, and transferring telomerase into patients’ T cells rescued them from dying. The finding suggests that restoring defective telomerase to T cells could possibly help “reset” the immune system in rheumatoid arthritis, Weyand says. Pharmaceutical industry researchers have been looking for drugs that could elevate or depress telomerase activity, with the goal of either prolonging life or treating cancer. However, turning on telomerase indiscriminately could lead to cancer, so any treatment would have to be targeted to the right cells, she says. The research was funded by the National Institutes of Health and the Diane Wolf Discovery Fund. Fujii is now an assistant professor of hematology and rheumatology at Tohoku University School of Medicine in Japan.